Swimming back to Chinese tables. Norway is the world’s biggest producer of salmon. But hardly any of it goes to China, the biggest consumer of seafood. Since the Nobel Prize was awarded to human rights activist Liu Xiaobo in 2010—at a ceremony in Oslo where the award was famously placed on an empty chair as Liu was in prison in China—Norway, and its fish, have been given the cold shoulder in China. In 2010, the country almost accounted for all of China’s salmon exports, according to data from the Norwegian government and DNB Markets, a Norwegian bank. 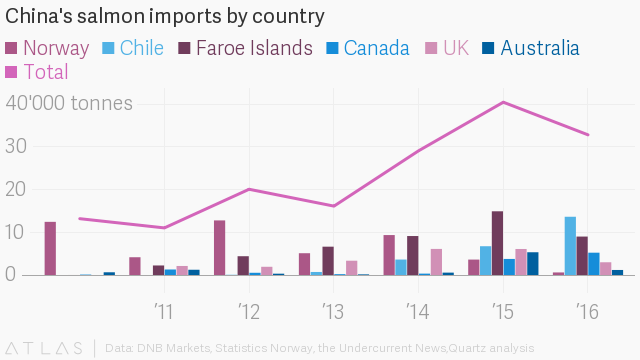 Since then, its salmon exports to the mainland have plummeted, and by 2015 even the Faroe Islands, Norway’s tiny Nordic neighbor, was exporting more salmon to China. So strained were relations that Norway’s ambassador to China, Svein O. Sæther, remained five years longer than the usual four-year tenure in his post for fear that a new ambassador may not be confirmed by Beijing, according to Norwegian newspaper Aftenposten (link in Norwegian). In December, the two countries made a breakthrough when they normalized relations (paywall) after Norway’s foreign minister visited Beijing. China said that Norway had “deeply reflected upon the reasons bilateral mutual trust was harmed.” Norway’s foreign ministry didn’t immediately respond to a request for comment for this story. Last month, Norway’s seafood industry appeared to get the firmest sign yet that the Chinese market would be fully opened back to them when a delegation visited China and signed a seafood trade agreement, with the aim of exporting $1.45 billion worth of salmon to China by 2025. The agreement came after Norwegian prime minister Erna Solberg’s visit to e-commerce giant Alibaba in April. 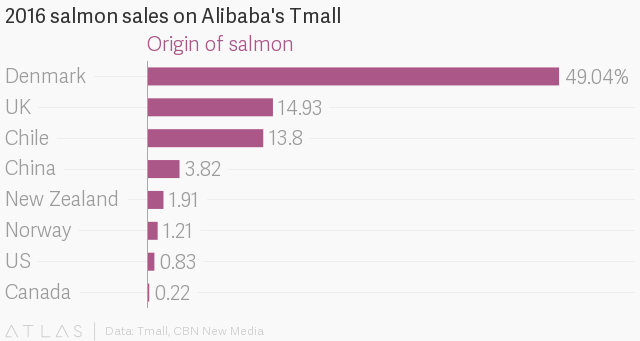 Taobao and Juhuasuan, two Alibaba-affiliated shopping sites, hosted promotional events for Norwegian salmon in May. A Chinese state-owned company will also deliver intelligent offshore fish farms—installations equipped with advanced technologies—estimated to be worth around $300 million, to Norwegian fish-farming giant SalMar, China Daily reported on June 5. Ivar Kolstad, an economist, calculated in a paper for Norwegian think-tank CMI that the freeze in Norway-China relations cost Norway $780 million to $1.3 billion in exports and said that China had become “too big to fault,” according to the Financial Times (paywall). Norway’s annual global exports totaled $104 billion in 2015. Norwegian fisheries minister Per Sandberg, head of the delegation, said that Norway “speaks up about human rights in many other circumstances,” and added “This time it is fish that matters!” according to Aftenposten (link in Norwegian) and a statement from the Norwegian Ministry of Trade, Industry and Fisheries. A spokesman for the ministry told Quartz that as part of prime minister’s Solberg’s April visit, Norway and China agreed to regularly discuss matters including human rights. A spokesman for the Norwegian foreign ministry told Quartz that “the normalization of relations” would “create major business opportunities for both countries,” with discussions on a free trade agreement to resume. “Norway and China has agreed to establish a consultation mechanism at political level between our foreign ministries, where we can discuss all matters of common interest, both bilateral and multilateral, including issues relating to the UN, human rights, and trade policy,” the spokesman added. In a counter view, more Norwegian salmon may have been reaching Chinese consumers than the official numbers suggest. In a paper (pdf, paywall) published last year, researchers at the Norwegian University of Life Sciences, said Norwegian salmon likely made its way around rules aimed at the product, possibly by entering the mainland via Vietnam, which appeared to see a sudden surge in salmon imports from Norway around 2011. The researchers based their conclusions on export figures in the region and interviews with stakeholders. In general, the overall impact of the Chinese salmon freeze on Norway’s economy has been “negligible,” according to an independent researcher on China and the Arctic who writes under a pseudonym, adding that overall trade between Norway and China continued have grown since the Nobel incident. Still, blocking salmon was an important way for China to express its “Nobel revenge” in a visible way, he said. It seems to have had results—in 2015, no Norwegian government members would meet with Tibetan spiritual leader the Dalai Lama, who is labeled as a separatist by Beijing, when he visited the country. This article has been updated to reflect comments by Norway’s foreign ministry.